Except the Valley of the Kings every necropolis of Luxor features in this photo collection: the Sheikh Abd el Qurnah Necropolis (7 tombs), the Necropolis of Deir el Medina (2 tombs), the Necropolis of Dra Abu el-Naga (1 tomb), the Necropolis of El-Khoka (3 tombs) and the Asasif Necropolis (2 tombs). These are commonly known as the "Tombs of the Nobles". Additionally one tomb in the Valley of the Queens is featured. No effort is spared to achieve the highest possible quality of photographic reproduction of the murals and reliefs, showing the original colours at neutral white balance and even lighting. Some subjects are well known, others rarely reproduced, like the ceilings. Details bring daily life and burial rituals of the ancient Egyptians into focus. The captions add in-depth information. [EGYPT 29319] ’Papyrus swamp in Menna's tomb at Luxor.’ This papyrus swamp is part of a hunting scene in the tomb of Menna. Ducks and other birds are nesting in the swamp and at least five nests with eggs are depicted. The latter are about to be plundered by a striped cat and a rodent. 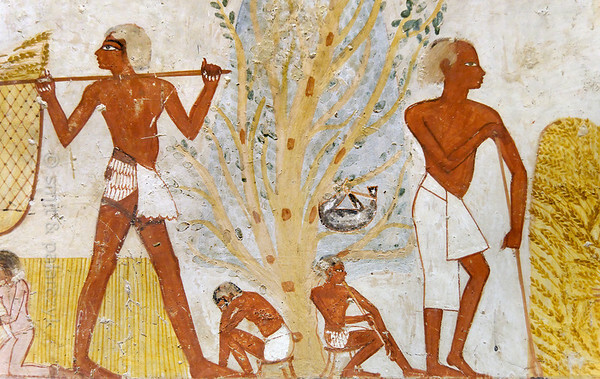 On the left Menna (only partly visible here) is standing on a papyrus boat and is holding two white birds which are possible used to lure other birds. He is hunting the fowl in the swamp with black throwing sticks, five of which are depicted among the startled birds. 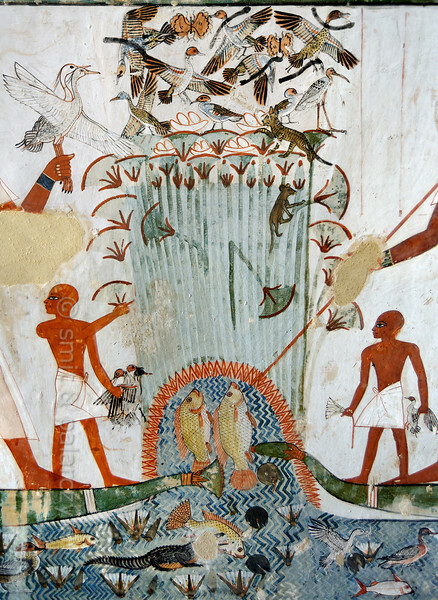 On the right a second representation of Menna (only his arm is visible) on a boat is spearing fish. 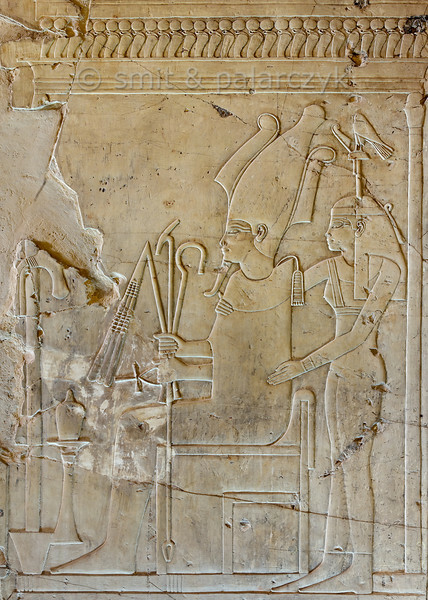 Standing before both representations of Menna are his sons, holding the caught birds and a lotus flower. The papyrus swamp was seen as a mythological place of regeneration and fertility. One of the wishes for the afterlife was phrased as follows: "May you pluck papyrus plants, rushes, lotuses and lotus buds. There shall come to you waterfowl in thousands, lying on your path; you cast your throwstick at them, and it means that a thousand are fallen at the sound of its wind . . . ." Menna was an 18th dynasty inspector of estates and overseer of harvests. His tomb (TT 69) can be found in the Sheikh Abd el Qurnah Necropolis on the Westbank at Luxor. It is one of the socalled "Tombs of the Nobles" and dates to the end of the reign of Thutmosis IV and the beginning of the reign of Amenhotep III. Photo Mick Palarczyk and Paul Smit. [EGYPT 29321] ’Ducks in Menna's tomb at Luxor.’ A pool with ducks and lotus flowers is part of a papyrus swamp hunting scene in the tomb of Menna. Menna was an 18th dynasty inspector of estates and overseer of harvests. His tomb (TT 69) can be found in the Sheikh Abd el Qurnah Necropolis on the Westbank at Luxor. It is one of the socalled "Tombs of the Nobles" and dates to the end of the reign of Thutmosis IV and the beginning of the reign of Amenhotep III. Photo Mick Palarczyk and Paul Smit. 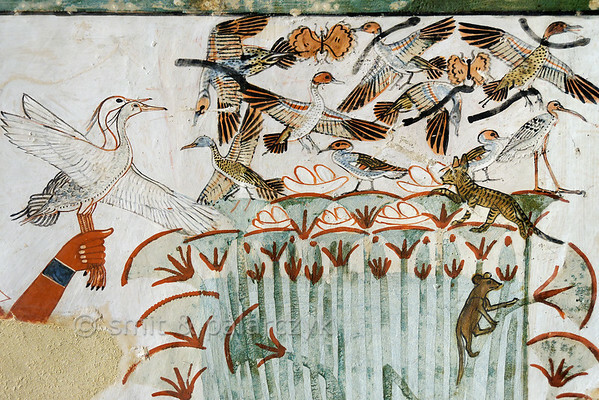 [EGYPT 29323] ’Girl with lotus flowers in Menna's tomb at Luxor.’ A mural detail in the tomb of Menna shows a young girl carrying lotus flowers and the ducks that her father Menna has caught while hunting in a papyrus swamp. Menna was an 18th dynasty inspector of estates and overseer of harvests and his tomb (TT 69) can be found in the Sheikh Abd el Qurnah Necropolis on the Westbank at Luxor. It is one of the socalled "Tombs of the Nobles" and dates to the end of the reign of Thutmosis IV and the beginning of the reign of Amenhotep III. Photo Mick Palarczyk and Paul Smit. [EGYPT 29325] ’Measuring the harvest in Menna's tomb at Luxor.’ This scene in the tomb of Menna portrays a man who is using a rope to measure a field in order to ascertain the portion of the harvest that will have to be paid as tax to the estate of the temple of Amon. Wrapped around his upper arm is spare coil of rope. He is followed by an apparently blind man who makes use of a cane and the head of a child to guide himself. The measuring dignitary is confronted by a man who is possibly the owner of the land and who is presenting a sheaf of wheat and a pointed bread. A bribe to lower the taxes? Menna was an 18th dynasty inspector of estates and overseer of harvests and his tomb (TT 69) is located in the Sheikh Abd el Qurnah Necropolis on the Westbank at Luxor. It is one of the socalled "Tombs of the Nobles" and dates to the end of the reign of Thutmosis IV and the beginning of the reign of Amenhotep III. Photo Mick Palarczyk and Paul Smit. 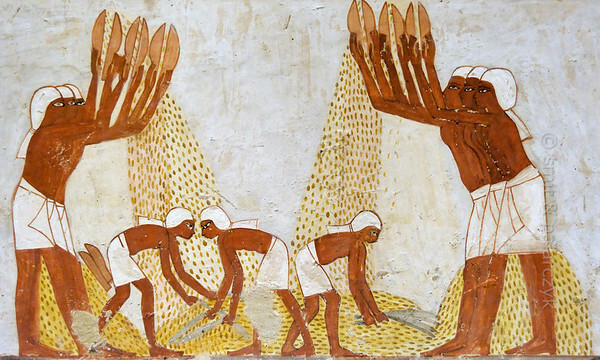 [EGYPT 29327] ’Winnowing scene in Menna's tomb at Luxor.’ Nine peasants occupy themselves with winnowing wheat in this scene in Menna's tomb. They all wear white scarfs to protect their hair from the dust. The six men at the edge of the scene each hold two scoops with which they toss the wheat, obtained from the piles behind them. The chaff, being lighter flies away while the heavier grains fall to the ground. 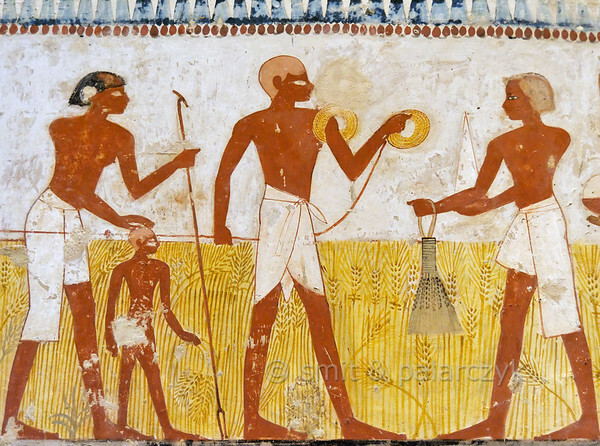 In the center three men with brooms clear away the dust and straw from the accumulating wheat grains. Menna was an 18th dynasty inspector of estates and overseer of harvests and his tomb (TT 69) is located in the Sheikh Abd el Qurnah Necropolis on the Westbank at Luxor. It is one of the socalled "Tombs of the Nobles" and dates to the end of the reign of Thutmosis IV and the beginning of the reign of Amenhotep III. Photo Mick Palarczyk and Paul Smit. [EGYPT 29329] ’Worship in Menna's tomb at Luxor.’ Menna's wife Henuttawi has her hands raised in worship in an offering scene on one of the walls of her husband's tomb. She wears an elaborate black wig, held in place by a headband with a lotus flower at the front. The wig is topped with a perfume cone of fragrant grease. 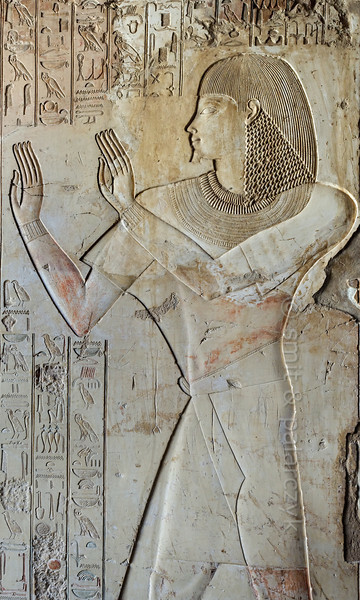 Menna was an 18th dynasty inspector of estates and overseer of harvests and his tomb (TT 69) is located in the Sheikh Abd el Qurnah Necropolis on the Westbank at Luxor. It is one of the socalled "Tombs of the Nobles" and dates to the end of the reign of Thutmosis IV and the beginning of the reign of Amenhotep III. Photo Mick Palarczyk and Paul Smit. [EGYPT 29331] 'Herding cattle in Khaemhat's tomb at Luxor.' 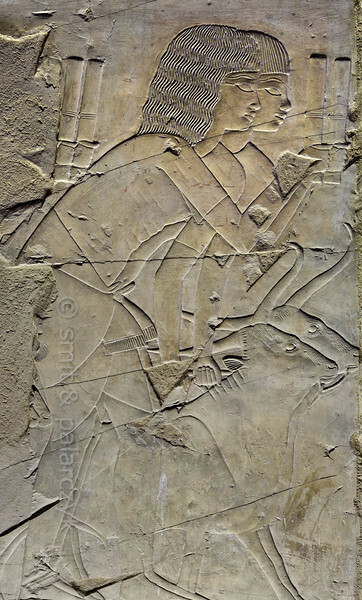 A well crafted relief in the tomb of Khaemhat shows two men herding cattle. Khaemhat (also known as Mahu) was an 18th dynasty royal scribe and 'Overseer of the Granaries of Upper and Lower Egypt. His tomb (TT 57) is located in the Sheikh Abd el Qurnah Necropolis on the Westbank at Luxor. It is one of the socalled "Tombs of the Nobles" and dates to the reign of Amenhotep III. Photo Mick Palarczyk and Paul Smit. [EGYPT 29333] ’Guests at funeral banquet in Ramose's tomb at Luxor.’ Guests at the funeral banquet of Ramose adorn the wall left of the entrance to his tomb. 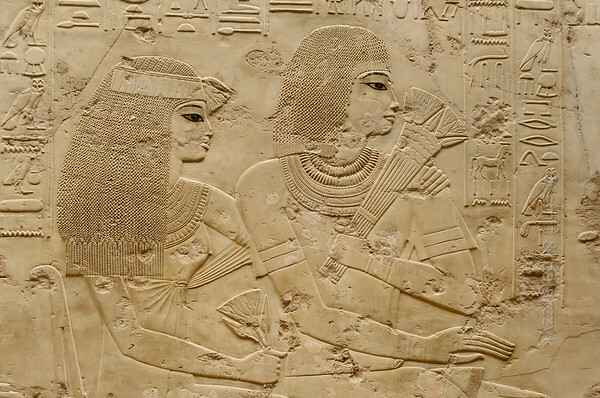 Depicted are Neby and Apuya, the parents of Ramose. The scene is carved with very fine detail into limestone and left uncoloured except for the eyes of the figures. Ramose was an 18th dynasty 'Governor of the Town' (of Thebes) and Vizier during the transition of the reigns of Amenhotep III and Echnaton. His tomb (TT 55) is located in the Sheikh Abd el Qurnah Necropolis on the Westbank at Luxor and is one of the socalled "Tombs of the Nobles". It is uncertain whether he was ever buried in this tomb or that he followed Echnaton to his new capital near Amarna and was buried there. Photo Mick Palarczyk and Paul Smit. [EGYPT 29320] ’Papyrus swamp in Menna's tomb at Luxor.’ This papyrus swamp is part of a hunting scene in the tomb of Menna. Ducks and other birds are nesting in the swamp and at least five nests with eggs are depicted. The latter are about to be plundered by a striped cat and a rodent. 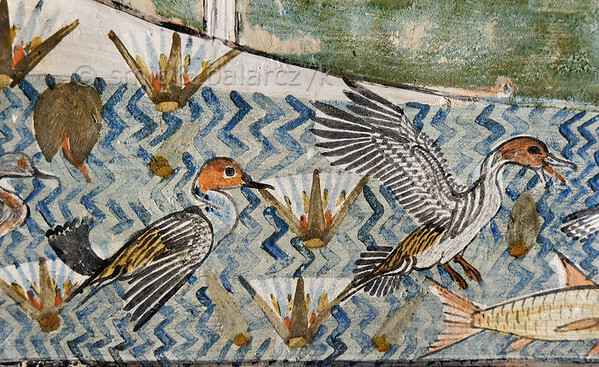 The fowl are hunted with throwing sticks, five of which are depicted among the startled birds. Menna was an 18th dynasty inspector of estates and overseer of harvests. His tomb (TT 69) can be found in the Sheikh Abd el Qurnah Necropolis on the Westbank at Luxor. It is one of the socalled "Tombs of the Nobles" and dates to the end of the reign of Thutmosis IV and the beginning of the reign of Amenhotep III. Photo Mick Palarczyk and Paul Smit. 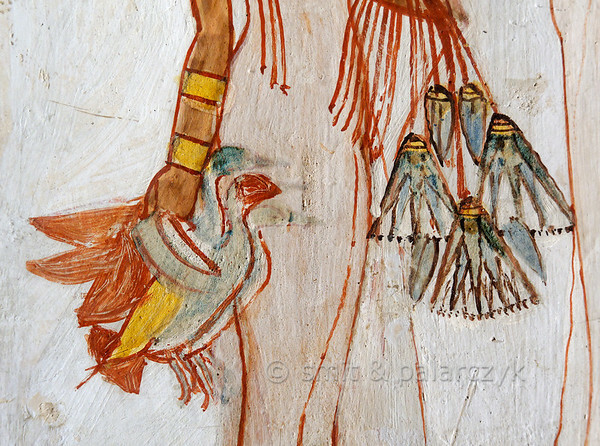 [EGYPT 29322] ’Girl with lotus flowers in Menna's tomb at Luxor.’ A mural detail in the tomb of Menna shows a young girl carrying lotus flowers and the ducks that her father Menna has caught while hunting in a papyrus swamp. Menna was an 18th dynasty inspector of estates and overseer of harvests and his tomb (TT 69) can be found in the Sheikh Abd el Qurnah Necropolis on the Westbank at Luxor. It is one of the socalled "Tombs of the Nobles" and dates to the end of the reign of Thutmosis IV and the beginning of the reign of Amenhotep III. Photo Mick Palarczyk and Paul Smit. 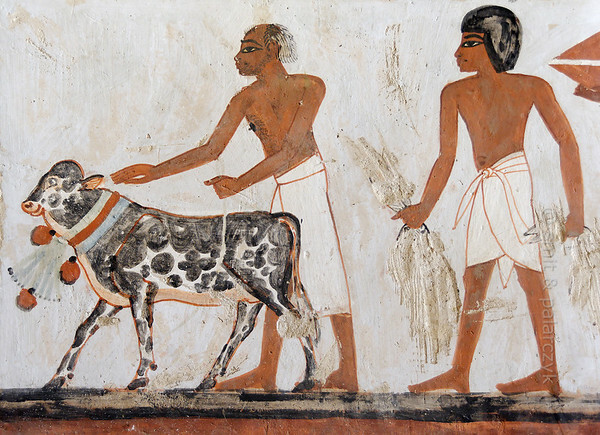 [EGYPT 29324] ’Herdsman with calf in Menna's tomb at Luxor.’ Leading a procession of offering bearers a herdsman with a receding hairline is guiding a calf, the neck of which is decorated with a lotus flower. 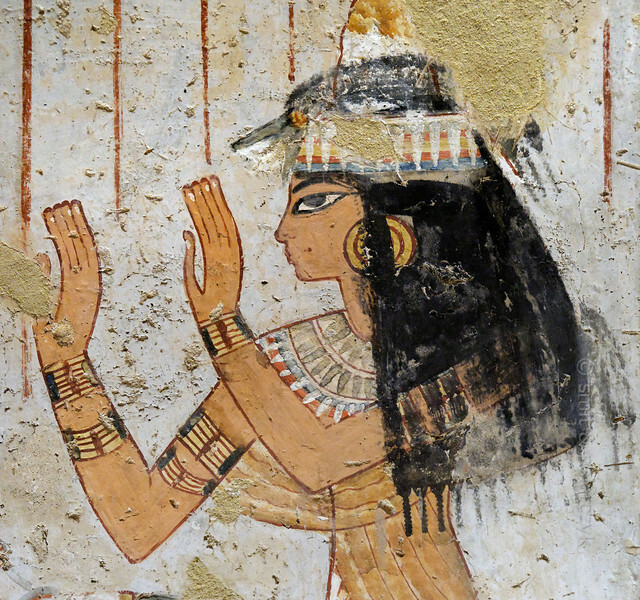 The scene can be found on one of the walls of the tomb of Menna. Menna was an 18th dynasty inspector of estates and overseer of harvests. His tomb (TT 69) is located in the Sheikh Abd el Qurnah Necropolis on the Westbank at Luxor. It is one of the socalled "Tombs of the Nobles" and dates to the end of the reign of Thutmosis IV and the beginning of the reign of Amenhotep III. Photo Mick Palarczyk and Paul Smit. [EGYPT 29326] ’Harvest scene in Menna's tomb at Luxor.’ This harvest scene in Menna's tomb shows a man carrying the crop in a large net suspended from a pole which rests on his shoulders. At the edge of the field two men are resting under a tree, each seated on a stool. The one on the left appears to have fallen asleep, while the other is playing a flute. A goatskin, probably filled with water, is hanging form the branches of the tree. On the right a supervisor is supporting himself with a staff. The heel of his front leg isn't resting on the ground, suggesting that he is handicapped. Menna was an 18th dynasty inspector of estates and overseer of harvests and his tomb (TT 69) is located in the Sheikh Abd el Qurnah Necropolis on the Westbank at Luxor. It is one of the socalled "Tombs of the Nobles" and dates to the end of the reign of Thutmosis IV and the beginning of the reign of Amenhotep III. Photo Mick Palarczyk and Paul Smit. 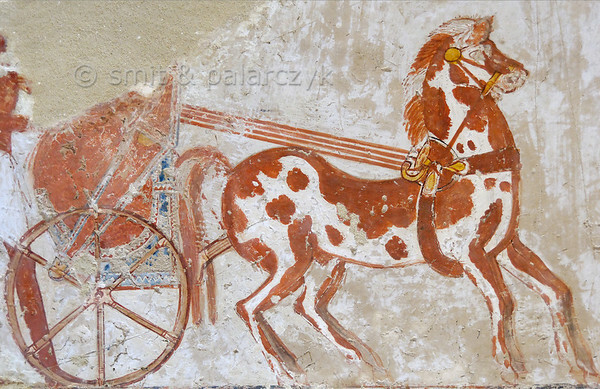 [EGYPT 29328] ’Chariot in Menna's tomb at Luxor.’ Menna's chariot is depicted on one of the walls of his tomb. Menna was an 18th dynasty inspector of estates and overseer of harvests. His tomb (TT 69) is located in the Sheikh Abd el Qurnah Necropolis on the Westbank at Luxor. It is one of the socalled "Tombs of the Nobles" and dates to the end of the reign of Thutmosis IV and the beginning of the reign of Amenhotep III. Photo Mick Palarczyk and Paul Smit. [EGYPT 29330] ’Relief of Khaemhat in his tomb at Luxor.’ The left wall of the entrance passage way of Khaemhat's tomb shows him worshipping the sun. The text columns record a hymn to Ra. Khaemhat (also known as Mahu) was an 18th dynasty royal scribe and 'Overseer of the Granaries of Upper and Lower Egypt. His tomb (TT 57) is located in the Sheikh Abd el Qurnah Necropolis on the Westbank at Luxor. It is one of the socalled "Tombs of the Nobles" and dates to the reign of Amenhotep III. Photo Mick Palarczyk and Paul Smit. [EGYPT 29332] Osiris and Hathor-Imentet in Khaemhat's tomb at Luxor.' A well crafted relief in the tomb of Khaemhat shows a seated Osiris embraced from behind by the Goddess of the West (Hathor-Imentet). She is the mistress of the west, the land of the deceased, and wears the hieroglyph for 'west' as a headdress. Khaemhat (also known as Mahu) was an 18th dynasty royal scribe and 'Overseer of the Granaries of Upper and Lower Egypt. His tomb (TT 57) is located in the Sheikh Abd el Qurnah Necropolis on the Westbank at Luxor. It is one of the socalled "Tombs of the Nobles" and dates to the reign of Amenhotep III. Photo Mick Palarczyk and Paul Smit.